Gravitational field of the existing place is being amplified by emphasizing dominant activities of local users. 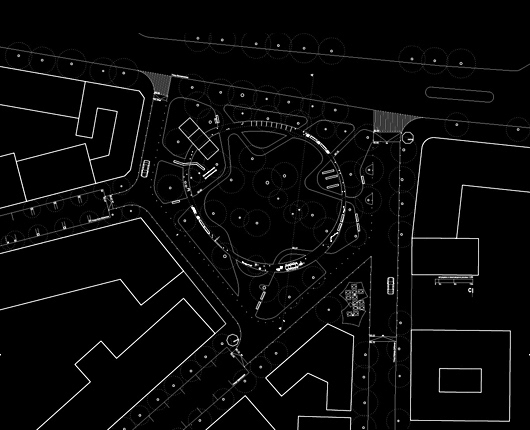 Along with phisiognomical restructuring of the square, interrelations within also change, thus recreating space's original purpose - park within the city square. The change is dual in nature: it nurtures existing memorial and spatial qualities of the square, while avoiding it's strict geometrical determinancy. These two entities interrelations creates series of spatial expiriences - linear transforms into circular, and circular into linear, again. Modulations within the state of these interrelations powers the change of understanding: it motivates and intensifies the use of square, while precieving the phenomenon of central space as a hub - meeting place and mediator of local users activities; therefore affirming sense of neighborgood, exchange, collectivity etc. Proposed enviroment functions as a diagram, whose characteristic points guide users behavior. Paths, architectural elements and determinants are all in service of the structuring of spatial contents. Binding of the square's spatial parts is phisical - with formal character of new assembly; and graphical - with pavement texturing. Pivotal part of the assembly - central ring with it's elements, acts as a spatial regulator, drawing it's origin from morphology of the existing place. New, interactive relationship is formed with the outer rim of the square. Ring's formal character is determined with distance between the square's surrounding buildings, while it's deformations (deviation from circular shape) expresses dimensional limes/an interaction between determinants of surrounding facades and ring morphology. By defining each other, they reveal the square as a new gravitational field.